The sun warmed the backs of the 1100 participants who gathered on Thursday 17 July in the Royal Hospital Kilmainham to ‘run the liberties’ in the 6th annual St. James’s Hospital Liberties Fun Run. 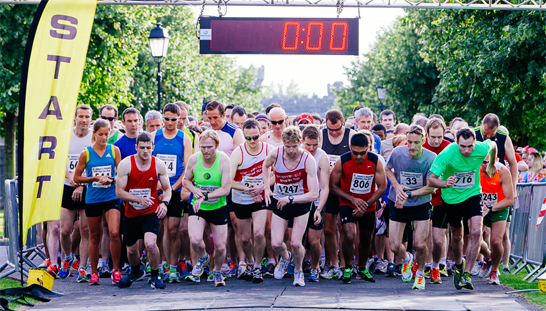 ST JAMES’S HOSPITAL LIBERTIES FUN RUN 2014 RACE RESULTS. Fun and sun were in the air as the hospital’s physiotherapists, led by ‘the Morph’ (aka physio Stu Garrett), conducted the pre-warm race up to the sound of “Drop the Murphys up the Boston” set against the beautiful backdrop of the RHK grounds and the Phoenix Park. Gavin Finlay, from Sportsworld, won the men’s category in an impressive 19:29. 1500m athlete Dr Orla Drumm, who had just joined the hospital staff that week and who is a member of Crusaders AC, won the women’s category for the second year running in 20:13, beating her own record from last year (20:27). Second and third places for the men were battled out between Umer Salati and Donal McGoldrick – both keen triathlon athletes; Umer came in at 19:53 with Donal at his shoulder at 19:59. And for the women, Grainne Butler, who runs with the Civil Service Harriers, came in second at 22:56 with Niamh Lynam-Lennon placed third at 24:14. Diageo and Momentum Support provided the first, second and third prizes for the men’s and women’s categories who won €200, €100 and €50 respectively. First time wheelchair entrant, Jonathan Hayes, completed the 6K course in 41:09. The course, which started and finished in the grounds of the Irish Museum of Modern Art/Royal Hospital Kilmainham, took in James’s Street, St. James’s Gate, St. Catherine’s Church, Thomas Street, the National College of Art and Design, Francis Street, The Coombe and the Guinness Storehouse. The turnout was fantastic (the precise number who registered for the race was 1096); Brian Fitzgerald, the hospital’s CEO, who also ran the race, thanked everyone who had taken part in the event. He noted that thanks to the generosity of major sponsors, local companies Diageo and Momentum Support, all entry fees and all sponsorship raised will benefit the development of family rooms within the hospital. Without the generous contributions and co-operation of a number of organisations, and the volunteers on the night, the Fun Run would not be possible. In particular, we are indebted to the Irish Museum of Modern Art at the Royal Hospital Kilmainham who hosted the event, sponsors Diageo and Momentum Support who provided the necessary funding, and An Garda Síochána who helped to plan and who managed the race with such precision on the night. We are most grateful to the following who were so generous: Clickworks who provided the wonderful ‘run the Liberties’ design concept pro bono, PML for arranging and donating the outdoor campaign, Medserv who made the technical tee-shirts a reality, ARUP, who provided the certifications for the timing clock and gantry, FM104 who sent along three Beetle Bugs and provided the face painting, Paddy’s Granola who handed out pots of granola and yoghurt, Seamus Griffin of Griffin’s Londis who provided water; Hair by Keville, the Meade Potato Company and the Natural Medicine Company who all provided spot prizes – the Natural Medicine company also gave the Weleda massage balm for the post-race massages; and thanks too to Arthur’s Pub for providing complimentary drinks after the event. The hospital is most grateful to the following statutory and voluntary agencies for their support in the planning and execution of this event: Dublin Bus, Dublin City Council, the HSE Ambulance Service, the HSE Emergency Service, Luis and the St John Ambulance Brigade. Thank you again to everyone who contributed to make the 2104 Fun Run such a successful evening and, of course, to all who participated in the race.